The time when you’d like to spray everyone and everything in sight with Lysol. Ohhh, poor thing! I hope he is better soon. Yuck, I’m sorry about the strep! I hope it moves along soon. 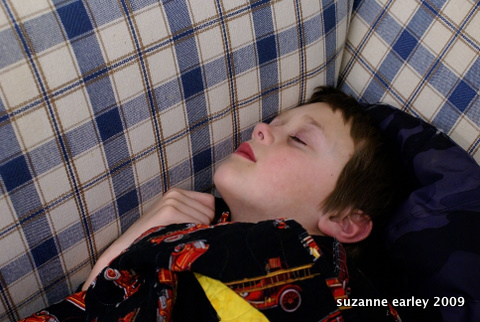 Is there any sight more wonderful than a kid with his eyes closed, even if he’s not really asleep? (I want to say beautiful instead of wonderful, but that might annoy your son.) They have that perfect skin and regular features. Be sure and get plenty of photos.